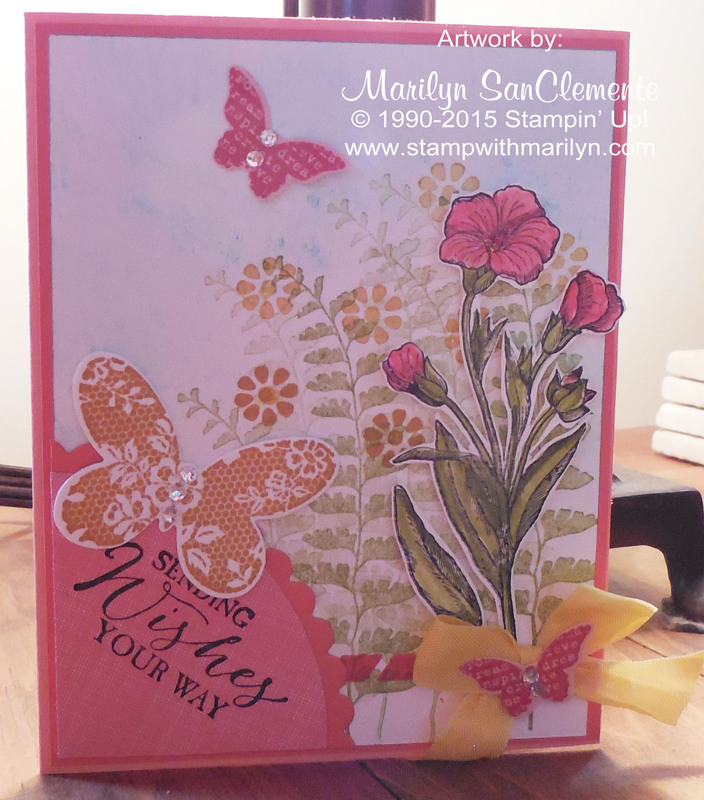 Marilyn SanClemente June 1, 2015 June 1, 2015 All Occasion Card, Mojo Monday Sketch Challenge, Stampin' Up! 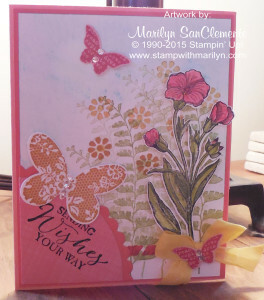 Today I have a card made with Butterfly Basics stamp set which is going to be in the new catalog starting tomorrow!! One of the things that I really love about this set is the matching framelits and the details that are available on the butterflies! 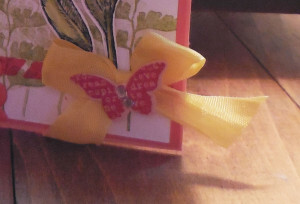 And there are more butterflies that will be available in the new catalog tomorrow! So don’t forget to stop back and check it out! This card is inspired by this week’s Mojo Monday sketch. As soon as I saw this sketch, I knew that I wanted to use this stamp set. Crisp Canteloupe which is a retiring color makes up the card base at 8 1/2″ x 5 1/2″, scored at 4 1/4″ and folded in half. Calypso Coral is the next layer at 5 3/8″ x 4 1/8″ with a 5 1/8″ x 3 7/8″ layer of Whisper White next. The Whisper White cardstock is stamped with images from the Basic Butterflies stamp set. The ferns are stamped using Old Olive ink which is also used to color the leaves of the flower. Strawberry Slush is used to color the flowers and stamp the small butterflies. 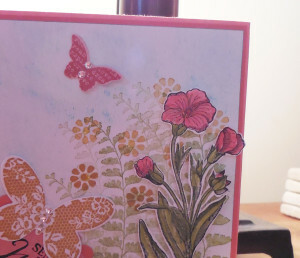 The background flowers and larger butterfly are stamped using one of the new colors, Delightful Dijon. I very lightly sponged a little Tempting Turquoise to the background of the garden scene. The element on the bottom left of the card is a piece of Calypso Coral cardstock cut using the Circle framelits. The center of this partial circle is a piece of retiring Stacked with Love DSP from the Occasions catalog. “Sending Wishes your way” is stamp with black Staz-on ink. And of course no project is complete without some bling. I added Rhinestone Jewels to the center of the butterflies. I also added a dab of dazzling details to the center of the flowers for a little sparkle. Don’t forget to stop by tomorrow to see all the great ideas from the new catalog! Such a pretty card. Love your beautiful stamped flowers and greenery. Thanks so much for joining in the fun at Mojo Monday!